Car detailing is significantly different to just car washing. Professional car detailing will protect the paint finish by removing surface contamination that washing alone won’t. It can also include cutting and polishing paint damage, waxing to a high gloss finish, wheel detailing, restoring faded trims, polishing of chrome parts, headlight lens correcting. Detailing is much more than simple car washing. 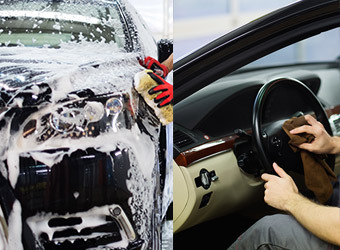 We use a variety of products including shampoos, cleaners, degreasers, protectants, lubricants, polishes, clay bars, compounds, and waxes to focus on every little part of the car to reach one large outcome, up to the various requirements of our consumers.